Kristoffersen: "I skied to my limit"
Henrik Kristoffersen is the new 2016 champion on the Ganslernhang, triumphing after an impressive second run only a few hundredths of a second ahead of Marcel Hirscher. "I know that even if I make mistakes I can still win races at the moment, because my speed is so high. I pushed myself to my absolute limit on the second run, but it worked so well that it was enough to win", said the delighted Norwegian. Considering how far he lagged behind after the first heat, this win in Kitzbühel is the greatest success thus far in his career. 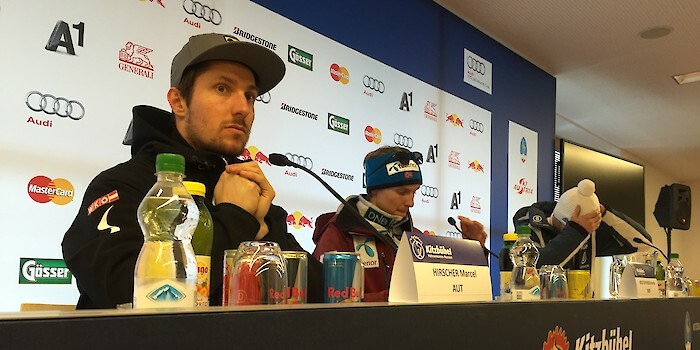 According to Marcel Hirscher, the Ganslernhang "was as hard as it had ever been" to ski. The fact that his performance did not suffice for a win is entirely down to Kristoffersen. "Henrik reminds me a bit of myself, when I had a phase a few years ago where I won absolutely everything", said the Salzburg athlete. When asked about the Overall World Cup Situation, Hirscher handed the baton to the young Norwegian, saying: "For me, he is now the favourite." In any case, Fritz Dopfer was very happy with his third place. "The first run went particularly well for me, like clockwork. During the second run I had to battle once or twice to hold my line", commented the Austrian-born athlete. It was also clear to Dopfer that it is extremely difficult to keep pace with the other two at the moment: "Right now, your only chance of coming close to them is with a perfect run."